2 sheets of cardboard the size of 21x30 cm. Embroidery positioning at a distance of 10 cm from the bottom edge of the fabric. Embroider thread floss in 2 addition — 1 x at 1 the cell tissue. 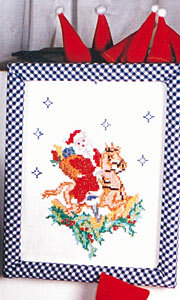 Head over to Santa Claus further embroider several stars thread in dark blue, placing them in random order. The finished embroidery to iron on the reverse side through a damp cloth. Cut excess fabric to the size 21x30 cm, neaten the edges and glue the fabric on the cardboard sheet. From another sheet cut out the frame with a width of 3 cm. In the received frame to insert a frame out of cardboard and covered it with a cloth, turning inside allowances at the inner perimeter of the frame. Allowances to sew by hand. The resulting frame to impose on cardboard with embroidery and pin with a few stitches.